Shop update: Sartoria Solito and Luca Avitabile shirts will be in the shop today and tomorrow for a trunk show. 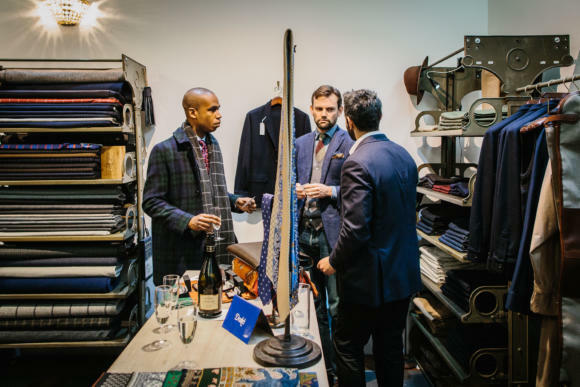 I was keen to have a cloth company as one of the exhibitors in our Savile Row pop-up shop. There's nothing like picking cloth from a full bolt, where you can drape it around yourself, get a real feel for the handle, or simply see how a check looks at scale. 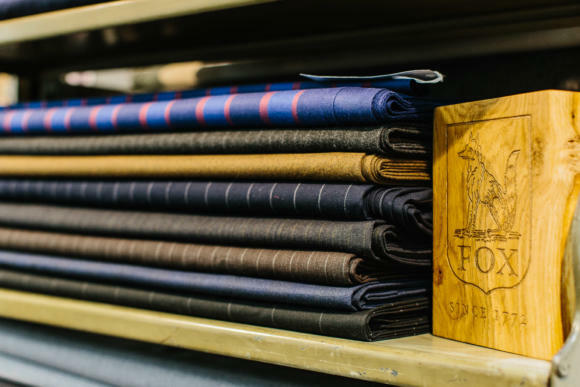 Fox Brothers were perfect, both because I could get another look at the vintage bolts I last saw back in 2011 (and made up into a green-flannel suit) and because the Merchant Fox has some finished products for non-bespoke customers as well. Those Merchant Fox products include a range of cloth caps, shown above. There are three designs: flat cap, peaked flat cap, and eight-piece. They are all in Fox cloth, some pretty heavy, and range in price from £95-£110. My favourite is the dark-grey eight-piece tweed. 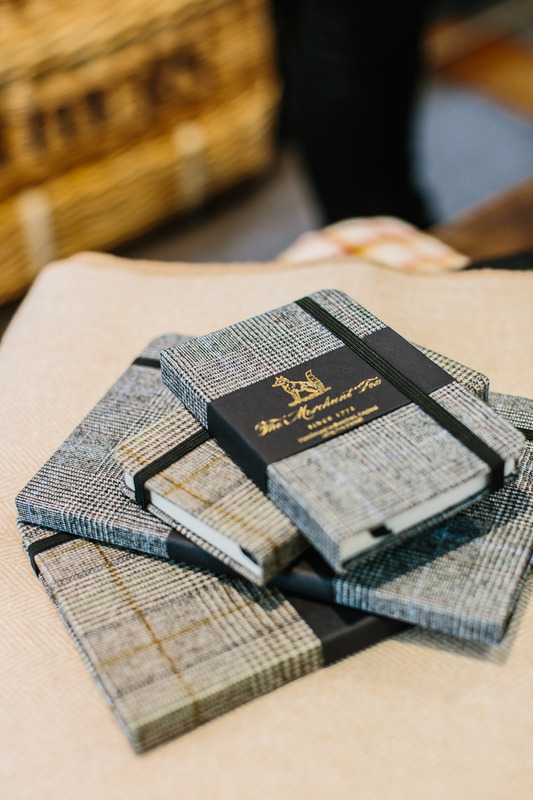 There are also some blankets (£120-£210), and cloth-covered notebooks (£40-£45, shown below). The star of the show, however, has to be the cloth. In the images here, the limited-edition cloth is broadly the thicker bolts, while the vintage pieces are the thinner ones. I've picked out two of each as my favourites - pictured above. There is a deep-green overcoating with a large black herringbone pattern, weighing 680/710 grammes. It's quite unusual and has a real strength of colour, but is dark enough to be quite wearable. That's a limited edition, as is the tweed jacketing in a large Prince of Wales check (a British wool weighing 470/500 grammes). As with many PoW checks, it will be the overcheck that will determine its appeal most - in this case in green and orange. The two vintage bolts are a yellow-green herringbone jacketing - Shetland wool weighing 530/560 grammes - and a chalkstripe merino flannel, at 370/400 grammes. Both are lovely, the former for its blend of grassy colours, and the latter for its visual texture but smooth handle. The Fox Brothers team have a cutting table downstairs, and some lovely branded paper, so do come and have a length cut if you want. 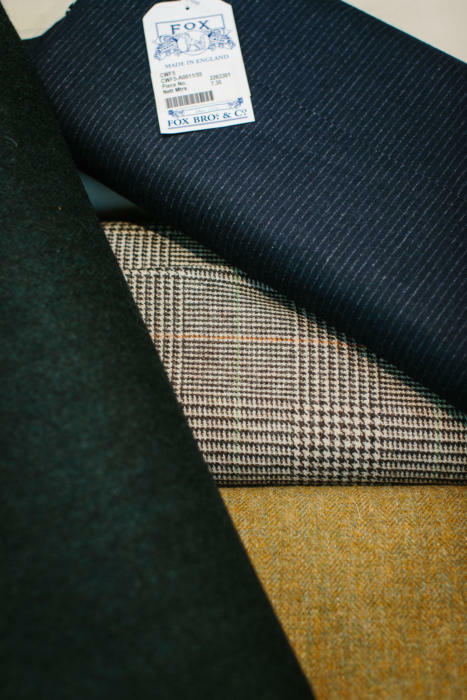 The cloth ranges from £82 to £92 per metre. The furniture in our pop-up shop, by the way, has been lent by the wonderful design and reclamation house Retrouvius in north London. If you don't know them already, their Kensal Green warehouse is well worth a visit. You can follow the discussion on Fox Brothers vintage cloth – available in the pop-up by entering your email address in the box below. You will then receive an email every time a new comment is added. These will also contain a link to a page where you can stop the alerts, and remove all of your related data from the site. As a relatively newcomer to the world of bespoke can I firstly thank you for such an interesting and invaluable website. 1. The first suit I had made was faultless and I had one basted fitting before the suit was ready (no forward fitting was offered or seemed to be required) but the second suit I had made came back with the lapel width a whole 1/2 inch less than the original and the cuffs and trousers both required altering. For this second suit the tailor had said that a basted fitting was now not required and the suit therefore had gone ‘straight to finish’ (as a paper pattern had obviously been made the first time round). Should I be insisting on at least one intermediate fitting every time regardless ( I am currently on the verge of ordering my third suit from this maker but again the tailor is suggesting going straight to finish)? 2. The gent who deals with me front of house and does my fittings is great but I do not believe he is the actual cutter, again is this something to be avoided? I am spending around 1,300 to 1,600 for a fully bespoke offering. Hi. Very pleased you’re finding it useful. 1. Yes, you should always have a fitting for a new suit. Firstly because it should make you suspicious about the process, and secondly because there’s a greater chance of issues that need to be corrected. And some (eg balance) cannot be corrected easily once the suit is finished. 2. It depends a lot on the salesman – some are very good, some are awful. But from the sound of the place, it sounds like he isn’t that experienced on knowledgeable. At the very least, you would expect the cutter to be present for your fitting. Thank you for your response Simon (and also to K. K . whose comment was very helpful). These sadly confirm my own thoughts and therefore I intend to try out a new tailor for my next commission (possibly Whitcombe & Shaftesbury)? I would be very wary of not being offered at least a basted fitting and a forward fitting on the first suit, and at least a forward fitting on the second, although again I would want a basted fitting unless it was exactly the same cut of suit and fitting appointments were difficult to arrange (such as with a travelling tailor). I suspect you are being pushed (charmingly) into a way of cutting costs, and I bet you did not get a discount on the second suit. For that sort of money, there are quite a few tailors within easy reach of central London who would give you a better service. I think only one (Graham Browne, still central) has been reviewed on here. It would be interesting, Simon, if you could review tailors such as W.G. 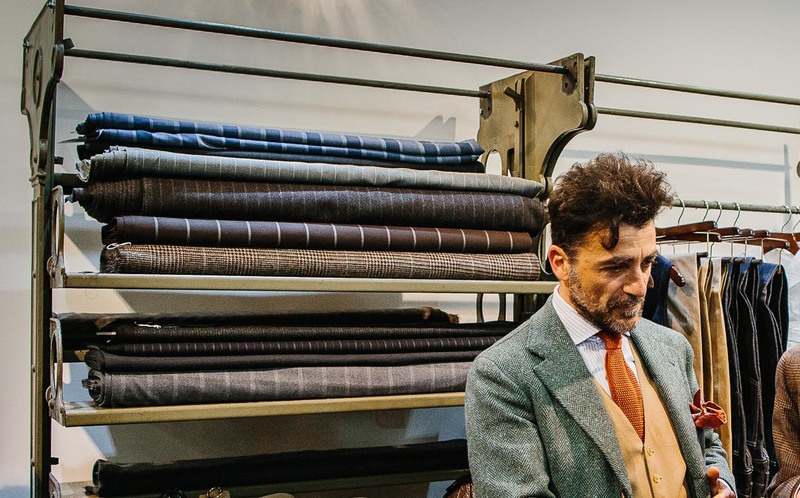 Child & Sons (a family business since 1890), D. Major, or Threadneedleman, since many of us readers, I suspect, will only ever experience a Savile Row suit vicariously through blogs such as this. I visited the shop on Wednesday evening and found it a very enjoyable experience. 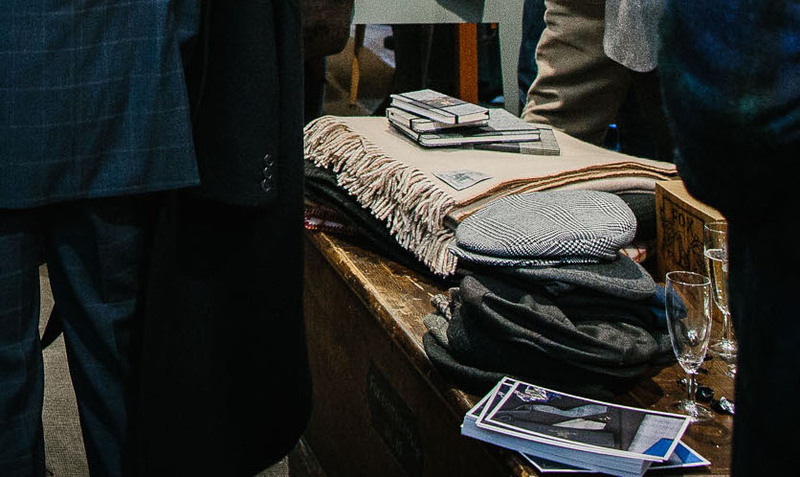 Over the years you have taken us on an amazingly rich journey through the world of bespoke and have helped create and link a community of people that would otherwise find the world of bespoke tailoring rather shadowy. I personally particularly enjoy your posts on bespoke commissions and appreciate your honesty on both the good and bad experiences which you have had. Thank you. On Wednesday evening I had the opportunity to speak to the representative of Sartoria Caliendo. I am considering commissioning a suit or jacket but couldn’t find any reference to this tailor on the site. Presumably this is a tailor whom you have used before ? Yes, that was Elia Caliendo. I have used him a lot actually, and could not recommend him more highly. Cloth weights are normally given in Ozs, with grammes as a secondary measurement. Why do you only refer to grammes in your article? Saying that is ‘normal’ isn’t really accurate. It depends what country you’re in – and sometimes even the mill within that country. Fox uses grammes by default. Most British mills and merchants lead with Ozs then show the metric equivalent ( multiply by 31). Fox differ but still show both. Most will understand cloth weight if Ozs are given but will be baffled by the metric weight. Popped into the shop today to see Luca. Nice to bump into Simon who looked very proprietorial. There was too much to see in one quick lunchtime visit! Ended up with a Frank Clegg garment bag and some Luca Faloni knitwear which was really stunning in the flesh. Slightly off topic, but are your familiar with Harrison’s new Fresco III book? Does it have a softer hand than Fresco II? The Minnis Fresco lll does have a softer hand that the ll, and some interesting colours and patterns. Whereas the ll feels quite harsh (although it wears very comfortably), I would liken the lll more to the 4 ply Finmeresco. I’m enjoying the mental image of you draped in a heavy flannel “toga” haha! 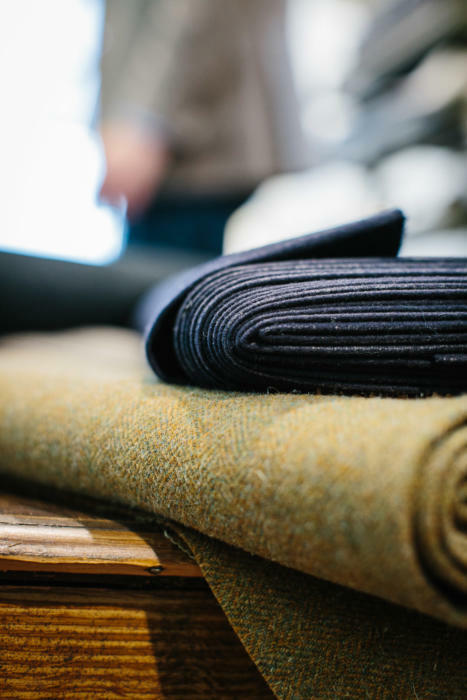 I know that we are not talking centuries here, but in having something made from truly vintage cloth, is there a danger that it may not last? At some point, of course fabric deteriorates (although everything we have that is very old, was never cared for – think shrouds, etc. ), but having a suite made from say 50 year old wool, are there issues one should be aware of? On the whole though, I think it is a great idea – I had some casual shirts made a few years back from psychedelic fabric my mother purchased in the 1960’s/70’s… I absolutely receive comments/complements every-time I wear them, without exception. No, the wool won’t have any issues in that regard. The environment something is kept in can cause it to deteriorate over long periods, but nothing would be sold that was in that condition. I’m a relatively recent newcomer to your blog, with various (and varying!) experience of London bespoke over the decades. The part of your blog I have found most helpful is the coverage of Italian makers, and on the back of this had a second meeting with Luca at the store on Friday. Diversifying away from T&A after 20 years so fingers crossed! I’m probably not alone in thinking you should make the store permanent (with a small p) but understand that’s not a trivial undertaking. If ever you go that route my prime suggested addition to the offering would be Oscalito underwear… in a league of its own. Also would love to be able to buy Calabrese ties in London. Come on Simon… take the plunge! In the meantime thanks so much for bringing us the manna from your sartorial heaven. Thanks for the comment on the longevity of wool.. Does that go for other fabrics , such as cotton, and linen? Beyond that, my guess is that there is a lot of vintage cotton for shirting one could dig up around the world…. While the quality of the work might not have been up to to bespoke these days, they always had many bolts of fabric…one wonders what happened to this stock when these places closed doors..